We live in tick-infested Maine, and this product really works to kill off any tick that dares to bite your dog. We still found a couple of ticks on our Digby, but they were either near death or already dead, which gives us peace of mind since we let our dog sleep in our bed. Digby has tested negative for Lymes disease, which I attribute to the use of this medication. Small and easy to hide in food for picky, medicine-spitting canines. All-around great product at an even better price! Nexgard is the best. Nexgard works better than any other flea remedy and my boy Jake likes the taste. 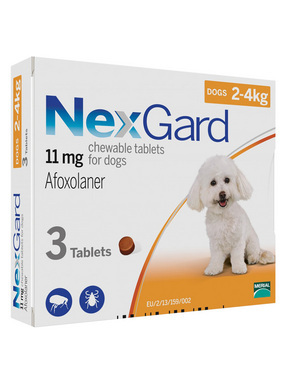 NexGard is the best, works within a few hours, instant relieve for my pooches. Was very surprised our little fussy dog took this pill/flavor chewable right away. We didn't have to hide the pill inside a piece of ham or liverwurst. We've had zero flea problems on her or in the house. Works great. I used several different products to control flea's from my pet's and home. Then I tried Nexgard it works really great. I never have a flea issue anymore. Thank you for offering it for such an incredible price. Much more affordable than from my vet's office. Thank's again !!! We moved to Maine, which is basically tick heaven. Since being on this medication, my dog, Digby, has not brought one live tick into the house. (I wish the same could be said for me!) And buying it from Joe?s saves us a bundle too. As soon as my puppy reached the minimum weight, we have her Nex Guard, because the veterinarian recommended it. My puppy loves it, gobbled it right down! No messy oils down her back, no struggling to get a pill down her throat! No fleas, or anything else. Since giving NexGard to our two dogs they haven't had fleas or ticks. Previously they have had ticks occasionally. We're all very satisfied!!! When I find a tick on my 75 lb. dog, it is always dead.